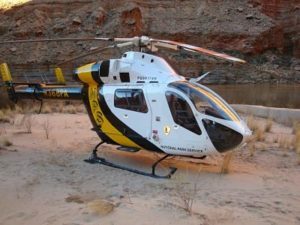 Medical helicopter evacuation in Grand Canyon. NPS photo. What happens when someone is injured or becomes ill on a commercial Grand Canyon raft adventure? It can be a very serious situation if the ailment is life threatening. A guest, guide, or even backpacker might need definitive medical care. 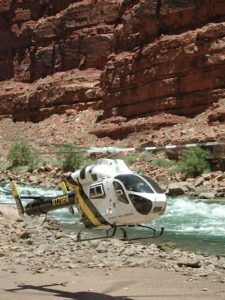 River guides can attempt to contact the National Park Service and request a medical helicopter evacuation. 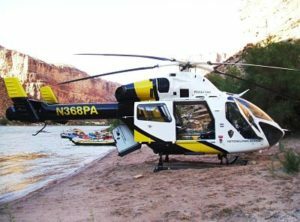 It is intense to witness a medical helicopter evacuation along the Colorado River in the wilderness of the Grand Canyon National Park. Consequently, there are practices and protocols in place to ensure a medical helicopter evacuation goes as smoothly as possible. Arizona Raft Adventures (AzRA), a popular Grand Canyon commercial rafting outfitter, takes about 1800 guests through the Grand Canyon annually. AzRA typically has between 6 and 8 medical helicopter evacuations per year. While no two situations are ever the same, medical helicopter evacuations do have similarities. Flying in the Grand Canyon for a medical helicopter evacuation is a dangerous job. NPS photo. Once the guides decide the participant needs definitive medical care, the first step is to contact the Grand Canyon National Park emergency dispatch. Professionally outfitted trips, like one provided by AzRA, carry three lines of backcountry communication tools. These tools include a satellite phone, a line of sight two-way radio and signal mirrors. The preferred method to use is the satellite phone. However, not all spots in the bottom of the Grand Canyon can access a satellite signal. In some cases, it is necessary for the guides to climb a slope or row across the river to make a connection with Park personnel. Finally, if attempts to reach the Park via satellite phone are exhausted, the guides attempt to utilize the two-way radios and signal mirrors. Emergency callers provide the location of the injured, the nature of the injury or illness and details about the patient. Common reasons which warrant medical helicopter evacuations include illnesses from the heat, broken bones, wound infections or complicating factors due to a pre-existing medical condition. The dispatcher passes the call to the Search and Rescue Ranger. The ranger reviews details regarding the patient and discusses a landing zone. Sometimes the trip moves because there is no suitable landing zone in the immediate area. Emergency response personnel provide an estimated time of arrival. They may arrive as soon as 45 minutes or it could be several hours. It may be longer and perhaps even overnight. 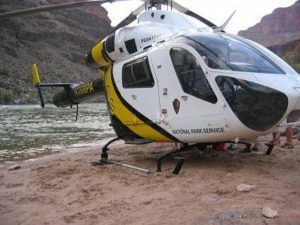 The Park may be dealing with multiple Grand Canyon helicopter evacuation requests. If this is the case, they triage the patients and address the most emergent situation first. Furthermore, weather conditions can cause a delay as the Park does not fly in inclement weather. Search and Rescue lands on sandy beach. NPS Photo. After the medical helicopter evacuation time and place have been confirmed, the guides prepare for the “bird.” At a minimum, this usually involves wetting down the sand in the area and marking the center of the landing zone with bright orange panels. If the group is already at camp then the entire camp needs to batten down. The trip leader instructs the guests to take down tents, help to secure the kitchen area and gather all loose articles. The guides discuss options for the rest of the group. The Park Service requires the trip to stay together so it is typically not an option for the rest of the trip to carry onward downstream. The guides offer an impromptu hike, present an extended geology lesson, lead a yoga session or something else of interest to the group. Nevertheless, when the “bird” comes in, the Park Service has routine expectations. The Park Service presumes everyone is gathered in one safe place. They want the area to be clear of loose gear and all other items to be secure. They expect for the lead guide to be on the radio to communicate directly with the pilot. Witnessing a medical helicopter evacuation sometimes feels dramatic and emotional. It is especially difficult because the group has been secluded from the outside world. Furthermore, there is often a sense of relief by the group that a fellow comrade will receive definitive medical care. Sometimes, with minor events, the primary feelings are excitement to see how it all works out and relief that help is on the way. There could also be is a sense of loss from the bonded group because the tribe is broken up by the event. However, there is often a sense of renewed community as the group gathers around the immediate family or friends left behind. The Park Service rarely takes out healthy family members. Furthermore, if you raft with Arizona Raft Adventures, it is important for the family and friends of the evacuee to know that by this time the management team has been notified. They are prepared to offer support once the patient arrives to a location determined by the National Park Service. Helicopter taking off at North Canyon for medical helicopter evacuation. NPS Photo. The helicopter rises off the floor of the Canyon and disappears over the walls out of sight. Next, the trip leader hits a reset button. Many times, the event brings the group closer together as they demonstrate working as a team and support each other during trying times. The guides and guests return their focus to the trip and continue onward. Most noteworthy, the guides continue filling the remaining days from dawn to dusk with memorable hikes, history and science lessons and opportunities for personal growth. A special thank you to Alan Fisk-Williams. Alan is a Grand Canyon river guide at Arizona Raft Adventures. His input and experience inspired this article. Sign up to receive an email notification when a new article posts on the AzRA blog.